Here is the same sampler as I did yesterday but in a dark olive green and the same medium avocado green as the last one. The colors in the photo are close but not true. As expected the analogous colors merge into one another in a pleasant way. Now I am off to select a beetle to design where I can try to incorporate these concepts. Here is a small sampler I did in taquete with three colors of sewing thread. I wanted to see how many shades of purple and green I could come up with by varying the colors coming to the surface in each spot. I was inspired by the woven tapestry on page 163 of the Fiber and Color book by Lambert. It was a piece done in red and green illustrating small areas of color producing optical mixing and larger areas creating color shifts by simultaneous contrast. 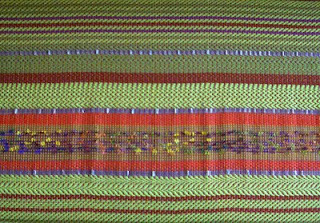 My piece is less than 4.5 inches by 3 inches but was quite complex to weave. There are sixteen permutations I came up with. 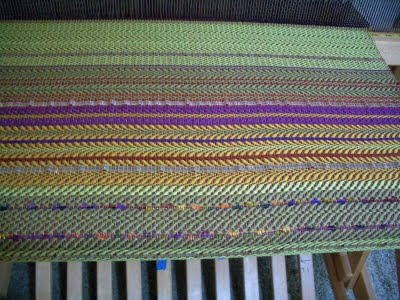 I wove a solid purple on the edges and a solid green in the middle so I could more easily compare the permutations with the solid color. This should be useful in improving my textile designs. In some ways the results are obvious...but this sampler is a visual reminder of the variety of shades of a color one can make by varying the quantity of a hue next to another. Plus, with the 'key' it will allow me to easily import the appropriate shade into my designs. The results are so interesting I am going to do the same thing over in analogous colors of the same values to see the blending of more similar colors. Our hero goes to her Westside Weavers meeting which is being held this month at her friend's house. As in most Guild meetings, there is much talk of fiber and other ordinary as well as curious things. She is most surprised to hear that her friend's house was burglarized and a number of items stolen. The entire Westside Weaving group tours the 'crime scene'. Later that evening our hero discusses her growing suspicions with her husband over a romantic dinner. Here's my latest beetle. It's taken awhile to get it done due to all my other projects at the moment. This is a Cyclommatus beetle; one of the varieties of the stag beetle. I experimented with this one to see the various effects I could achieve with the copper and 'black' I was using. You can see the effects at the edges of the beetle and in the larger portions of black. 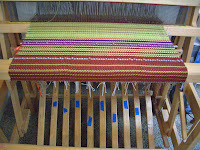 Each pixel of color in weaving is composed of two passes of the shuttle with the given color; a round trip so to speak from one side of the loom to the other and back home again. The colors that rise to the surface are the ones you see; I hide the others underneath. I was able to achieve a darker copper by allowing both the black and the copper to rise to the surface in the same spot. 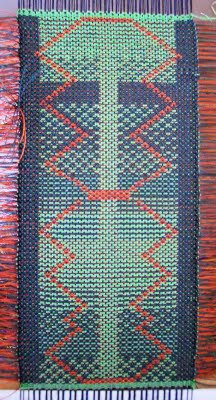 I was able to achieve a subtle shimmer of copper in the black; like a shadow of copper by allowing the copper to rise to the surface along with the black on only one pass across of the loom. On the way back only the black rose to the surface. I was able to achieve a mottled black by alternating solid black withe black and copper. I am considering doing a little sampler so I can see in a more controlled way the impact of the various effects. Having finished weaving chapter 3, I have completed the weaving of Act 1 of my mystery story. In this chapter we learn many curious details about the dead person found by the hero as well as a variety of robberies and thefts occurring through out Santa Monica. The curiosity of the hero grows as she is more and more certain that something isn't quite right. She feels a sense of dread as she commits to finding out what. Now I am off to write it all down. I am playing around with the concept of simultaneous contrast with taquete in order to select the 'right' colors for a piece I have designed. I haven't put any photos up since I have found it near impossible to photograph the color purple with either of my cameras regardless of the adjustments I make to the camera and light. It always comes out blue. Best I can do so far is to adjust the blues in photoshop but overall the colors are still no where close to true. I need to play around some more with the software and the cameras. This is the best photo of the actual unwoven colors. I had them shaded from any direct light. 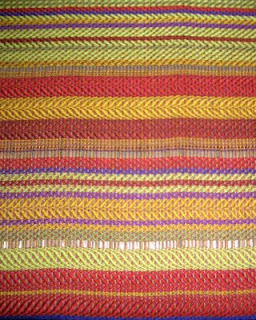 They all shifted in color when woven. 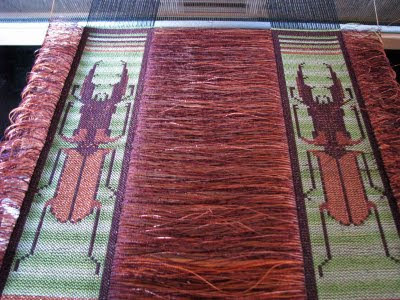 Here is my sample woven with a purple background with a beetle in two near complements; adjusted in photoshop. The hues, values and chromas do not look like they do in person. They have been impacted by the light, the camera, photoshop as well as the principle of simultaneous contrast. Best to study the concept with the actual weavings in hand. Chapter two of my mystery is written and woven. This chapter provides details on the suspicious circumstances surrounding the dead body which our hero found on the way to the Santa Monica Farmers Market. Just completed chapter one of my mystery story in words and weft. Chapter One takes place at a party. It's the 25th anniversary of Max and Irma. Max is a successful businessman. Irma is our hero's best friend and fellow weaver. The guest list is a who's who on the Westside of Los Angeles. Here's what chapter one looks like in bamboo.